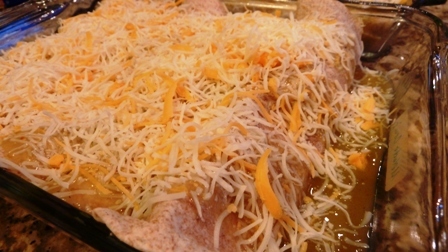 Black Bean Chicken Enchiladas, Enchiladas, food, Lake Cumberland State Park, Lure Lodge, Taste of Home, Whatever Happened to Dinner? My oldest daughter first made these for the extended family when we were enjoying a summer vacation together at Lake Cumberland State Park, Kentucky. (If you go, beware that the campground and the resort part with cabins are in TWO DIFFERENT TIME ZONES!) Since some of the family was camping and some in cabins, that made for some interesting calculations the whole time. 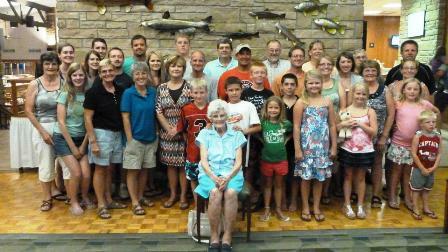 Bertha Miller front; children, in-laws, grands and great grands, Lure Lodge, Kentucky, July 4, 2012. Anyway, it was our family’s turn to cook for everyone so Michelle volunteered, brave child, to make enchiladas. Some weren’t even sure whether they would like them but as far as I know, they were a hit with everyone. Michelle did not get her cooking chops from me—but from a gourmet cooking class she enrolled in soon after she and her husband got married. It gave her the nudge she needed to branch out and experiment far from the basics she grew up with: my Indiana-Mennonite farm fare and her father’s family’s Virginia cooking traditions. 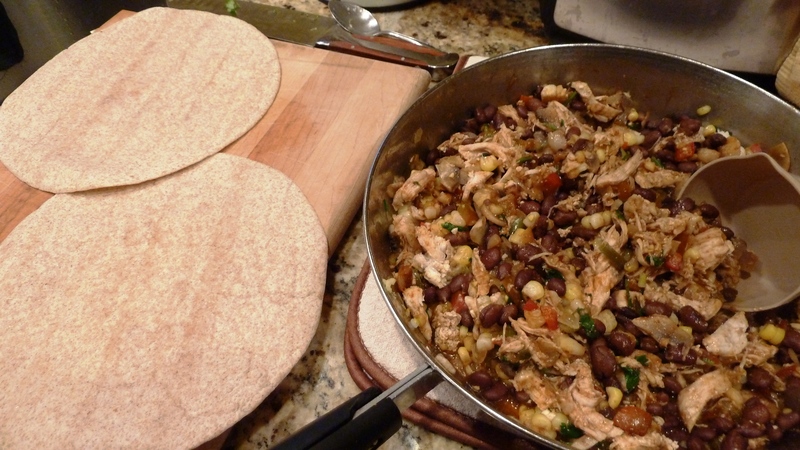 Here is the recipe Michelle used, adapted from a recipe called Black Bean Veggie Enchiladas from Taste of Home, but she added chicken. I believe she quadrupled it for this crowd. 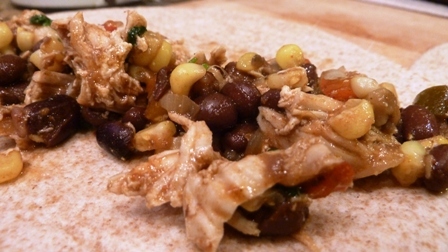 She picked this recipe because it included some slightly healthier options. 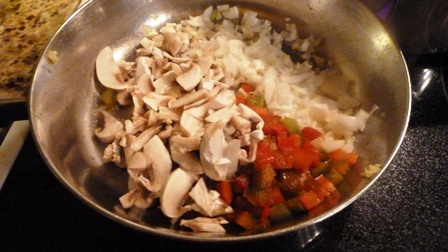 In skillet, saute the onion, green pepper (in this case I was using sweet red pepper) and mushrooms in oil until tender. Add garlic; cook 1 minute longer. 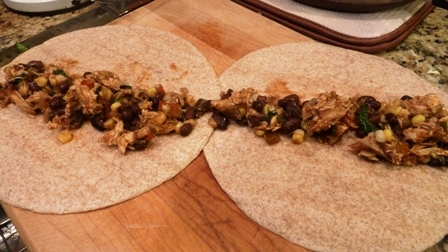 Add the beans, corn, chilies, taco seasoning and cilantro; cook for 2-3 minutes or until heated through. Stir in shredded chicken to mix thoroughly. Bake, uncovered, at 350° for 25-30 minutes or until heated through. Yield: 8 enchiladas. Commenters at Taste of Home said they used sour cream and more cilantro on top. 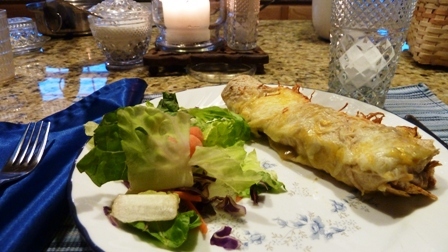 There’s also a recipe for Enchiladas in my book, Whatever Happened to Dinner, using a homemade ranchero sauce instead of canned enchilada sauce I need to try sometime. Buy the book here! Thank you for commenting! Tonya (BTW, I have a daughter Tanya and we say it like your name)– the name of your blog leads me to mention a new Facebook page getting under way called “I Grew Up Country.” One of my colleagues Shirley Hershey Showalter is involved and she told me about it. It might be a place for you to share some of you posts too! In case you’re interested. This is a side tracked comment as I clicked on you link about Virginia traditions. We pass the bread first and there is always butter and jam. In my family it was a “most likely”to be on the table and in my husband’s family it is a “must” . I think my mother in law baked at least 10 loaves of bread a week along with buns and quick breads. We put bread or rolls out with most meals, though my husband has learned to adapt.. if we are having Indian it may be naan. When my brother in law lives with us ( he moves from relative to relative ) he loves sandwiches every meal. I have to double the amount of bread I make. Side tracked comments gladly accepted and enjoyed! Does this mean you make all your bread? Wow, I’m very impressed. Isn’t naan or tortilla a wonderful substitute in “the daily bread”? I’m also fascinated by the “must haves” in our family traditions. Thanks for contributing to these streams of conversation with your ideas and memories! I do bake a lot because I like to bake. I make 2 loaves white bread all the time , every once in awhile rye. I’ll buy pumpernikel if I come across it. I don’t feel I make good whole wheat so I might buy that occasionally. But at $5-$6 for a decent loaf, I’m too cheap for that. I make quick bread every week, like banana bread or cranberry orange nut bread (from berries I froze in Fall). I make 4 smaller loaves at a time so we have 2, I can take one to give away and put one in the freezer. 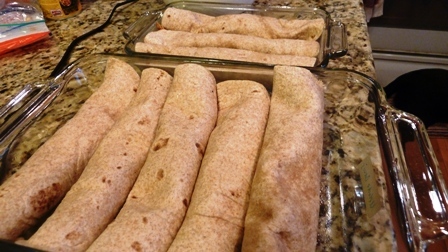 I’ve never made tortillas, we don’t use them that often. I’ll randomly make bagels or sweet rolls or pecan sticky buns , dinner rolls, hamburger buns. I will buy bagels if we are somewhere that has real New York type bagels The grocery store wanted $2.89 for 8 buns! My oldest girl has been perfecting English muffins and sharing with us. Also brioche buns and baguettes. My oldest boy makes pretzel rolls and shares. The two older are married with their own homes and they like to cook and bake also. I just started making the naan last year to go with our curry dinners. I watched Indian ladies on YouTube demonstrating and found a recipe I liked best. Amazing, Athanasia! Quite a baker of bread. Have you tried the oatmeal bread I have on this blog? It doesn’t use a lot of whole wheat and is our family favorite, hands down. I will need to watch some YouTube demos! Good idea. What kind of pan–a cast iron skillet?